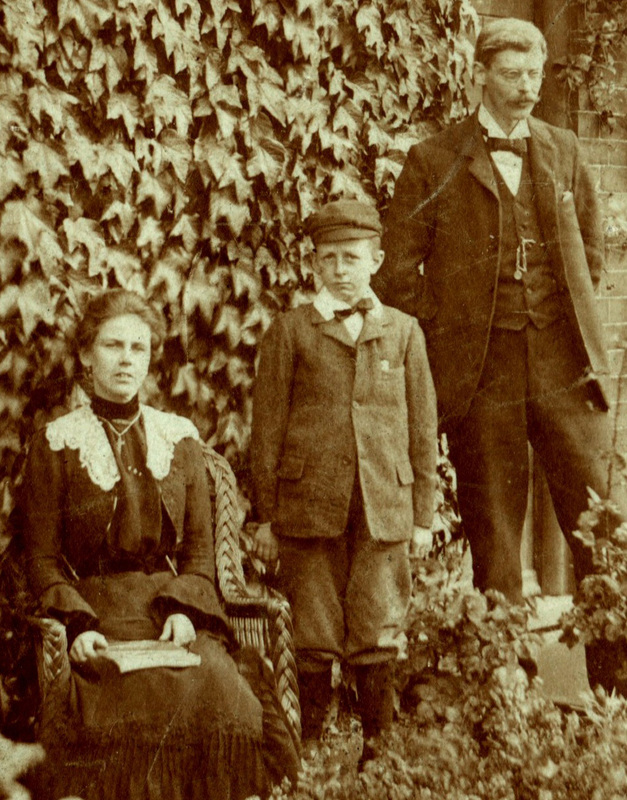 Thought to be Wilfred (rather than Victor) Barrand, aged c.10, between his aunt Mary Elizabeth Collet and uncle Victor Collet, outside the School House, c.1910. From the Webster private collection. 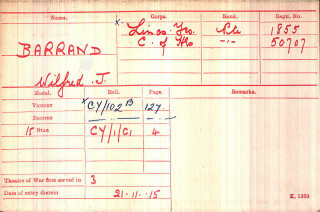 Private Wilfred Barrand's medal index card. Wilfred Barrand is one of the men on the list of Absentee Voters in 1919. Wilfred Joseph Barrand was born in 1893, at Sculcoates, Hull. His father was Fred Barrand, a tailor, born in Grantham in 1869. Wilfred’s mother was Maria Percival Palmer, born in Grantham in December, 1865. Maria’s father was Robert P. Palmer, and her sister (Wilfred’s aunt) was Mary Elizabeth Palmer, who married Victor George Collet, headmaster of Bottesford village school. Both Wilfred and his younger brother, Victor, served in the army during WW1. 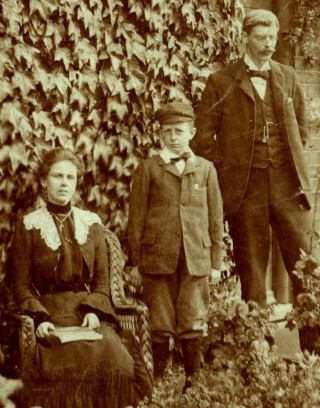 In 1901, Wilfred was living with his aunt Mary and uncle Victor, in the school house on Grantham Road, Bottesford, while his mother and brother lived at the house of grandfather Palmer, in Westgate, Grantham. In 1911, he was still with his aunt and uncle at the school house. By this time, his mother, brother and grandfather Palmer had also joined the household. Wilfred was 17 years old and employed as a farm labourer. This may be a modest description, in that it is clear from his subsequent service career indicates that he was probably skilled in working with horses. Neither of these Census records mentions Wilfred’s father, Fred Barrand, yet Fred was very much alive in 1928, when he was witness at brother Victor’s wedding (and possibly also at Wilfred’s wedding in 1932, though this not been confirmed). He is probably the Fred Barrand whose birth and death records give him as born 1869, and died at Hull in 1935, aged 66 (General Register of Births, Marriages and Deaths). Maria Percival Barrand (nee Palmer) was born at Grantham in 1865, and died also in the Grantham area (possibly in Bottesford) in 1937, aged 72. Fred and Maria married in 1893, at Peterborough. Fred is then found in the Census of 1901 at 10, Smeaton Street, Sculcoates, where he is a “clothier’s assistant” born 1869 at Grantham. He is 32 years old, married, but living alone as one of four boarders in the house of Phylis Drayton. It is tempting to suggest that the couple had separated, Fred staying in Hull while Maria and the boys moved back to Grantham and Bottesford, but this is not certain. Only Wilfred Barrand’s Medal Index Card and Medal Roll entries were located; no attestation papers or records have been located as yet. 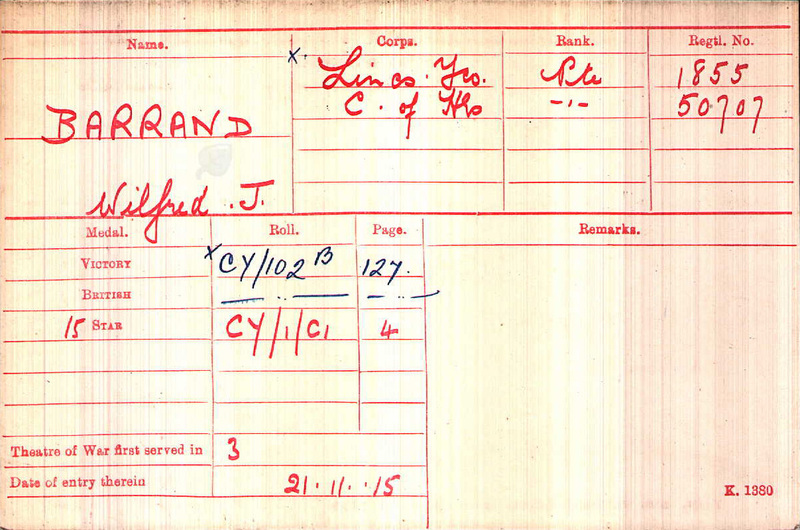 Wilfred Barrand enlisted as a Private in the Lincolnshire Yeomanry: his Service Number was 1855. His exact date of enlistment has not been established, but must have been in 1914 because he was awarded the 1914-15 Star. What we do know, from his Medal Index Card, is that he arrived (‘disembarked’) in Theatre no.3, on the 21st November, 1915. At some point, he transferred to the Household Cavalry and Cavalry of the Line, in the Corps of Hussars, as Private 50707, and he was eventually retained in the Reserve. The Lincolnshire Yeomanry were engaged in 1915/16 in fighting in the Balkans (Salonika) and Egypt (1914-19 net). The Hussars were a long-established part of the British Army, part of the Household Cavalry. They also fought in Egypt and Palestine during WW1, so it is possible but not confirmed that Private Barrand remained in this Theatre through much of the war. Spring 1921 – he lived on Grantham Road, probably at the School House, while his mother Maria and brother Victor Percival lived together on Church Street, probably at Rutland House (3, Church Street). Spring 1923 – Wilfred and his mother share a house in Easthorpe, but Victor has left the village. Another couple named Barrand, Jabez and Agnes, now live at Station House. Autumn 1925 – Wilfred and Maria are still at an address in Easthorpe; Jabez and Agnes Barrand are at Station House. 1929 – Wilfred and Maria live in a house on Market St; Jabez and Agnes Barrand live at Station House. No further records were located regarding his domicile after 1929, perhaps the online Electoral Roll database ends at this date. In 1932, Wilfred Barrand married Vera F. Fudge at Taunton. Vera died in 1942, and Wilfred married again in 1945, to Olive L Chilcott, again in Taunton. Wilfred Barrand died in March 1974, aged 80, in Taunton Somerset.